Whenever firing a firearm, it is always important to make sure that you are wearing eye and ear protection. I am an audio guy: I make a living off of using my ears. Needless to say, I take protecting them very seriously. So, when Southern Guns, LLC in Longwood, Florida said they had some hearing protection for me to review, I said hell yes. I normally wear the old school and big ear muffs. They are big, take up a lot of room in the range bag, get in the way of eye protection and shouldering a weapon, and trap in a lot of heat, but they work at cutting down sound, and the work quite well. However, the product today is called “Flugz”. They are basically moldable ear plugs. Now, you don’t need your ears professionally molded, and you don’t have to pay over a hundred dollars for it. These you stick in water and microwave them to heat them up, and then form them to your ears. They cost around $25! They come with a container to keep them in and with a lanyard to keep the two plugs together. Getting them to fit to your ear is simple. It took me two tries to get them right. I stuck them in the microwave again for another twenty seconds after fiddling with them for about a minute and a half. The second time they came out nice and soft and molded well to my ear with some light pressure. I decided to go to the range and test out three different methods of hearing protection: earmuffs, standard disposable ear plugs, and Flugz. I was shooting 115 grain, Blazer, aluminum cased ammunition out of a Smith and Wesson M&P9. I went to the best local range in town to do so, and that's East Orange Shooting Sports. The earmuffs canceled out the most sound and most frequencies. Granted, they cover your whole ear, so that is expected. However, as mentioned, they do take up room in the range bag, and they can get in the way of your shooting glasses and the stock of a firearm you are trying to shoulder. Still, they are cheap and do work. The ones I used claimed to reduce noise by 33 decibels. That’s quite a bold claim. Now, they did work, but a lot of high frequencies made it through. They are obviously easy to carry, cheap, and don’t interfere with your glasses or stock. If it’s all you have, it’s better than nothing, and they make a great backup. 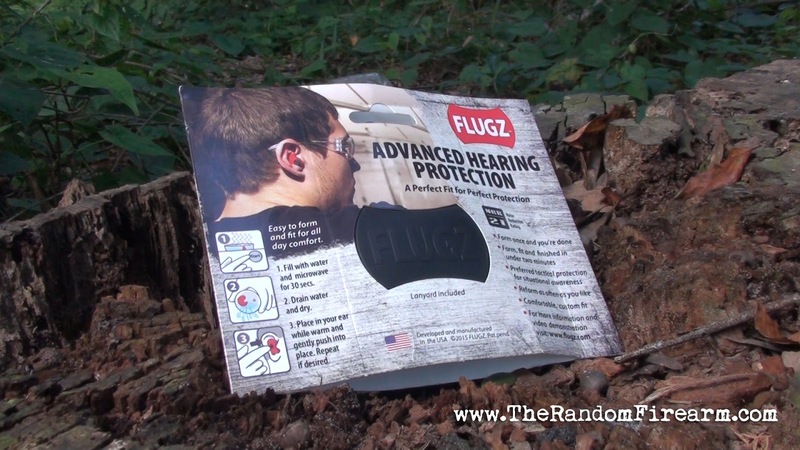 Now, these do offer the least amount of protection based off of the noise reduction rating. They performed better than the disposable ear plugs, but still not as good as the earmuffs. However, they are reusable, remoldable, easy to carry, custom fit, don’t get in the way of glasses or a stock, and a good price for what they are. They also were a little challenging to get into my ears a second time, but with practice, I’m sure I can get past that. All in all, I have to say that I like using the Flugz, and I will continue to use them. Again, I take my hearing very seriously, so even if they are only rated at a NRR of 21dB, they are comfortable and unobtrusive. Now as a reward for sticking with this whole review, Southern Guns, LLC has worked out a deal with The Random Firearm. If you go to Southern Guns and mention this review, you can get them for $19.99! Just tell them The Random Firearm sent you! Have you used Flugz? Let me know in the comments below. Want more reviews like this? Don’t forget to check us on Facebook, Twitter, and YouTube! Thanks for stopping by!